We took the liberty of doing the hard work for you: collecting the most creative cart abandonment emails right now on the web. With our latest feature release, your cart abandonment automations and your product recommendation emails have gotten an impressive upgrade. In our quest to make your cart abandonment emails even more interactive, we came up with a way to give your subscribers more by doing less. Increase the average order value and total number of conversions on your eshop, without increasing the frequency of the emails you send out. Instead, have your subscribers receive the real-time reflection of their cart, as well as the recommended products based on their popularity or the revenue they generate. Essentially, you premium-ify your abandoned shopping cart email to include a product recommendation update that real-time reflect user preference. All of that, automatically and dynamically injected into your email campaign. Every piece of information your user needs (cart abandonment items), and everything they will need (product recommendation items), is served to them in advance. But first, let’s take a look at the essentials. Your website is your source of revenue. But it’s leaking, unless you have cart abandonment emails set up. According to a massive Baymard Institute study on cart abandonment rate based on case studies, an average of 69.23% of shopping carts are abandoned. This means that every eshop owner is losing money; agonizing over website visits, spending on ads, only to get zero or little money back. What makes cart abandonment email automations insanely effective is that they help drive approximately one third of your website visitors back to your site, to complete their order through their saved cart. It has been found that sending out cart abandonment emails after one hour since the abandonment has a higher conversion potential. Couple it with a loud and clear CTA button, smart copy, and compelling visuals to lure your customers in. Today, we’re adding one more feature to this process. With conversion optimization in mind, we built an exciting new feature that will make your customers fall in love with you! Personalization never was easier! Wondering why your website visitors bail on their shopping carts? Statista sheds some light on the top reasons US consumers stated as their primary reasons for doing so. According to the bar chart, we see that most reasons are related to shipping costs, dubbing shipping the number one reason why an online customer could get frustrated and not complete their purchase: high shipping fees, as well as the mere fact that there are shipping fees, unawareness of shipping fees, shipping that takes too long, all take their toll on your eshop’s performance. Other reasons for cart abandonment include lack of purchase intention altogether, poor site navigation, and a lengthy ordering process. Your website is your source of revenue. But it’s leaking, unless you make efforts to recapture customers who have abandoned checkout. To that extent, cart abandonment emails are crucial to keep in touch with them. Kiss shipping-related hiccups goodbye: with cart abandonment emails, you get a second chance to convert your website visitor by tackling the number one cause. Simply send an email offering free shipping costs for their purchase. How to avoid it having an impact on your revenue? Offer it to first-time visitors, so that they can experience shopping on your website. At the same time, you’ll be able to keep their contact details and grow your mailing list. If you have established an automated onboarding sequence for your first-time customers, you’ll nurture them into lifelong customers over time. Offer it to those spending more than $100 on your website– this way, you can segment them into your highly-engaged and VIP customer list, and onboard them accordingly. Before we move on to our email design checklist, let’s take a look around the web’s best cart abandonment emails. Under a very Kate-Spade-y subject line (“a little something to sweeten your day”), Kate Spade reaches out to their cart abandoners with a pretty and smart email. The email layout intelligently plays on the reminder theme with a knot on the index finger! This visual just adds even more to the overall brand persona of Kate Spade. Also, did you notice the top of the email? Aligned with the playful style of the brand, here comes a “don’t forget…” attention grabber and a short, text-only note (including the unique checkout code) that is faster for grabs. Color-wise? The newsletter design is clean, white background, logo on the top left, free shipping on the top right, complete product categories, the creative – enriched with a direct link to the shopping cart, and a few product recommendations to complement the email. By default, employing humor is the common way for the majority of brands to get back to their customers. Doing so is important as it will give you more chances of eliciting engagement from your subscribers. The truth is that, once your user left the website, they are no longer interested in your offering. If you are going to ping them once again, make sure there is something in for them, too. Making them smile is one way to break the ice, getting them to stay longer on your email, and then drawing their attention το their cart…and your discount. This email also features clean design and the exact same element structure we examined above, only this time it actually showcases the content of the shopping cart. This is what everyone means when they talk about dynamic content, and it makes every cart abandonment email, unique! In other words, no two subscribers ever get the same cart abandonment email – unless they have selected the same items, of course! Having clarified that shipping and returns are complimentary, Nordstrom chooses a personal, chatty style (“Still thinking it over?”). We love how it sounds like a best friend, or that tiny little voice inside your head pushing you to make the purchase. Wait, there’s no tiny little voice? What? Smart copy that reaches out to connect with the subscriber (although it doesn’t clearly specify how to do so), and the shopping cart link with a dynamic link to the product(s). What we could have used here would be more details about the item(s), namely price or the color. This cart abandonment email is a value-adder, both for the brand and for the customer: the brand showcases the entire cart realistically, and the customer gets a complete view of what they left behind, along with a tele-transport button back to the checkout process. The popular department store brings in two main sections: a generic one with a young fashionista carrying shopping bags, and another where three cart abandonment items are displayed. The top tier is made up of the “Reminder copy” (“You have items in your big brown bag”), complete with a call to urgency (“before they sell out”), a link to the shopping cart, and a reminder that free shipping applies to orders of $150 or more. The second section comes with a very convincing feature; images of the abandoned items worn by models. This is a smart way to help your subscribers visualize what the item will look like, and tempt them into buying them. This smart check-list style of a cart abandonment email is one of our favorite ways to go about styling cart abandonment blocks and product recommendation blocks. What is more, going for a clean background allows for the items to steal the show! The jeans company has a big surprise for their users: 25% off their purchase, applied at checkout. This cart abandonment email has a clear title, a major discount coupon, a link to the shopping cart – to create a sense of urgency, there is a message informing the recipient that they should complete checkout within 48 hours. This cart abandonment email is no exception to the aforementioned tactics, with one little twist: it has ultimately minimal copy with maximal meaning: “OOPS!”. How could anyone have said it better? Get yourself a quick-scan level copy that is effective at what it communicates. And is ffffffun! What images you decide to include is key: The image of the woman carrying six boxes of shoes subliminally encourages getting more of these boxes, as one is not necessarily too much. This newsletter layout here is a product recommendation matrix that catches the eye and communicates the objective clearly. By “handpicked for you” overlooking the email, recipients can take a quick glance of various product categories for a total of up to 10 products. Our suggestion is to top it off with a strong CTA button at the center or at the bottom: A/B test for a couple of hours with 20% of your list, then you’ll see which one performs better. Did you know you could bring in the most popular products (in terms of times viewed) or the highest revenue-generating ones, and those ordered the most? By “Shop the favorites”, Julep here does not specify which of the three this refers to, but it’s still very effective and click-worthy! By now, you may have noticed that the majority of these emails feature excellent copy, employing humor. This is important as it will give you more chances of eliciting engagement from your subscribers. The truth is that, once your user left the website, they are no longer interested in your offering. If you are going to ping them once again, make sure there is something in for them, too. Looking for more? Take a look at how to create abandoned cart emails that actually work. 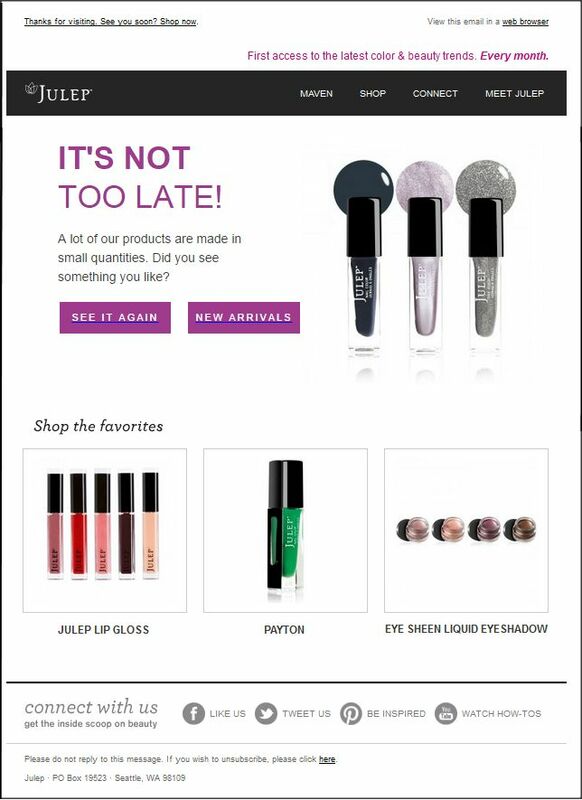 Decide on a newsletter layout: is it cart abandonment-only? Are you bringing in product recommendation blocks, too? If so, which type of the three? Come up with compelling copy for your subject line and your body text. Keep it short and relevant. Make sure the images of the products are kings and queens of the email, so avoid adding “extra noise” with a colorful background. Add a sweet CTA button – rounder buttons seem to perform better, but you can A/B test your click-to-open rate against a regular CTA button! Prepare a couple of versions and show them to your colleagues or friends- see which one made their eyes pop with astonishment! Looking forward to getting started? Are you feeling all your creativity rushing through your veins and straight to your fingertips? Then, we should not squander time! Head over to our Editor and start customizing your Cart Abandonment email right away! What’s your cart abandonment and product recommendation emails like? We’re rolling out new features every week! Can you keep up with us? Well, our blog subscription can help you with it!